We offer various means of file delivery and real-time connection with clients as well, and keep up with the latest advancements in technology and communication. CONTACT US to make a real-time recording appointment. 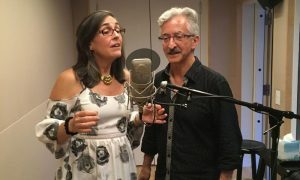 Rosi & Brian are proud to offer recording sessions via Source-Connect, a revolutionary system enabling real-time audio connections between voice artists and clients. Experience a direct link to our studio and listen in on your recording session using your internet connection and computer (PC or Mac). Rosi & Brian are happy to work with ipDTL, a great alternative to ISDN, allowing clients to listen in real time to audio sessions and recordings via Google Chrome. No special hardware or software required – just listen through your browser! Need to connect via ISDN? No problem! We’re pleased to offer ISDN sessions through ipDTL. Let us know if you’d like to schedule a free test! Please check below for dates we will be away from our studio. Our regular studio hours are 9:30-5:30 ET, Monday-Friday, and occasionally we work on weekends to meet our clients’ needs. If the date you want doesn’t appear in the events below, it means we’re in and the mic is on! Please CONTACT US about adding our voices to your upcoming project!